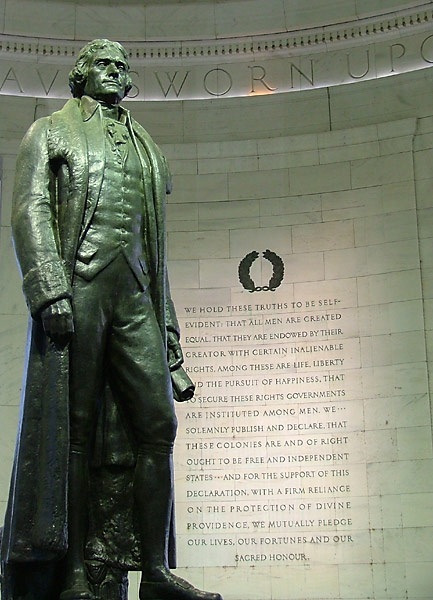 Thomas Jefferson was born on APRIL 13, 1743. He drafted the Declaration of Independence, was Governor of Virginia and founded the University of Virginia. He was U.S. Minister to France, Secretary of State under President Washington, and Vice-President under John Adams. As the 3rd U.S. President, he approved the Louisiana Purchase and sent Lewis and Clark to explore it. He sent the Marines to stop the Muslim Barbary Pirates of Tripoli. On May 24, 1774, Thomas Jefferson drafted a Virginia Resolution calling for a Day of Fasting, Humiliation and Prayer for their sister colony of Massachusetts. The doctrines of Jesus are simple, and tend all to the happiness of man. Thomas Jefferson, The Writings of Thomas Jefferson, Albert Bergh, editor (Washington, D. C.: Thomas Jefferson Memorial Assoc., 1904), Vol. XV, p. 383, to Dr. Benjamin Waterhouse on June 26, 1822. The practice of morality being necessary for the well being of society, He [God] has taken care to impress its precepts so indelibly on our hearts that they shall not be effaced by the subtleties of our brain. We all agree in the obligation of the moral principles of Jesus and nowhere will they be found delivered in greater purity than in His discourses. Thomas Jefferson, The Writings of Thomas Jefferson, Alberty Ellery Bergh, editor (Washington D.C.: The Thomas Jefferson Memorial Association, 1904), Vol. XII, p. 315, to James Fishback, September 27, 1809. I am a Christian in the only sense in which He wished anyone to be: sincerely attached to His doctrines in preference to all others. Thomas Jefferson, Memoir, Correspondence, and Miscellanies from the Papers of Thomas Jefferson, Thomas Jefferson Randolph, editor (Boston: Grey & Bowen, 1830), Vol. III, p. 506, to Benjamin Rush, April 21, 1803. I am a real Christian – that is to say, a disciple of the doctrines of Jesus Christ. Thomas Jefferson, The Writings of Thomas Jefferson, Albert Ellery Bergh, editor (Washington, D.C.: The Thomas Jefferson Memorial Association, 1904), Vol. XIV, p. 385, to Charles Thomson on January 9, 1816. Jefferson also published a work called, “The Life and Morals of Jesus of Nazareth Extracted Textually from the Gospels,” in his late 70’s after the death of his wife. Some have said it is a Bible and others have said is a compilation of his favorite verses. Much controversy surrounds this publication. From Wall Builders Website: This document is permission for a ship called the Herschel to proceed on its journey to the port of London. The interesting characteristic of this document is the use of the phrase “in the year of our Lord Christ.” Many official documents say “in the year of our Lord,” but we have found very few that include the word “Christ.” However, this is the explicitly Christian language that President Thomas Jefferson chose to use in official public presidential documents. Do you have the courage to read my post which counters this? This Jefferson scholar wonders,…..